Happy New Year from Karelia Software! We’ve been busy here at Karelia over the last month, so we have a long issue this time. Be sure to participate in our poll below! Today we are pleased to announce iMedia Browser 2, available, for free, exclusively on the Mac App Store. iMedia 2 is a huge rewrite, with many aspects re-written from the ground up. The big goal for iMedia 2 was to make it much, much faster. You can browse your media in several styles: as a grid of thumbnails, a simple list of titles, or in a “combo view” that shows a thumbnail on the left and information about the item on the right. QuickLook is also integrated into iMedia Browser 2: just hit the space bar to bring up a slideshow of your selection. So, what are you waiting for? Download iMedia Browser today! And if you like iMedia 2, please take a moment to rate it — and maybe even write a short review — after you have installed the new version. Thanks! What would you most like to see in Sandvox 2? Go ahead — click on one of the links above, so we know which feature we should emphasize the most. We’ll keep you posted on the progress of Sandvox 2 as it gets closer to release! There is a lot of misinformation about the relative merits of pay-per-click (PPC) marketing against those of organic search. If you currently have a website (Sandvox-built or otherwise) or are considering one, it is important to understand the distinctions as well as the pros and cons of each. Does PPC work? The answer is a qualified ‘yes.’ Often, paying advertisers complain that they get poor return on investment and end up spending more than is yielded in sales or leads. Generally this is a result of poor or inadequate keyword research and testing. It is very tempting to begin a Google AdWords campaign without confirmation that the keyword position you are buying is the most relevant and effective one possible for your company. But, when done correctly, sponsored search marketing is a key to immediate first page placement and substantial traffic to your site. So, does Organic Search Optimization work? Organic positioning, the main focus of any search engine results page, is a result of many factors, some of which are beyond your control. Without question, the ticket to first page organic listing is the dedicated and persistent acquisition of back links. And, it isn’t about quantity as much as quality. One highly ranked site that links back to yours is worth 150 links from new, unproven sites. The bottom line: If you can afford to spend what it will take to compete for the top sponsored ad placements, especially now, you will likely be rewarded with immediate results. It’s a short-cut, but it’s important that you test the return on your investment. 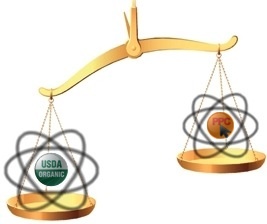 And for long-term organic placement, no matter what, do everything you can do to acquire as many relevant, quality links as possible and strive for solid, long-term organic placement. Next month we will give you some great tips on how best to acquire links. Until then, the search continues! If you would like to have your website considered for our Websites of the Month spotlight, just choose “Submit to Site Directory…” from the Site menu in Sandvox, and fill out the details about your site (or sites). Doing so will get your website listed on SandvoxSites.com, and we may choose to feature your site in a future mailing of our newsletter. 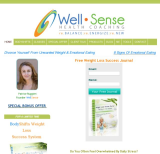 Patrice Ruggieri has incorporated the necessary elements of providing a polished appearance, a good offer, and some calls-to-action on her site at Well Sense Health Coaching. She realizes that the opening view must not be full of wordy self-praise. She manages to create interest in her weight loss program, a very competitive industry. The initial impact entices us to scroll down and read the content below. Website marketing is different than other forms of advertising. You must capture attention quickly and persuade the site visitor to stick around longer than the 8 seconds most of us take for an initial view. Notice how the professional, yet simple “Earth and Sky” design enhances the content without detracting from the message. Well done, Patrice! Under most circumstances, audio and video attachments on a website landing page prove to be distracting and a fundamental marketing flaw. They usually hinder the very goal of the website, which is to quickly engage the site visitor in a content-reading or perusing exercise. Here is an exception to the rule! Steve Talbot (no relation to any of the Karelia staff) is a professional announcer. Voice-overs are his commodity. 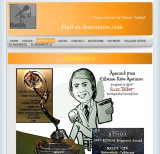 Mr. Talbot has very capably integrated a clever and fun way to introduce visitors to his multiple audio personalities at his Find An Announcer website. The “Wall” design from Sandvox Pro offers just the right enhancements to facilitate the user experience. His written copy utilizes a larger font which encourages us to read the limited accompanying content. If you are in the business of providing voice-overs, musical or video services, you would be wise to avail yourself of the various options accessible to Sandvox site builders. Ms. Welk has effectively employed audio/visual tools to enhance her site. 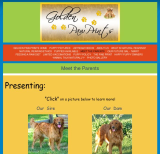 YouTube videos of her golden retriever puppies are strong sales vehicles without forcing them upon site visitors. No wonder she currently has no puppies available!